butler service, delicious local fresh food. During the course of the next 3 days we we had visitors to our houseboat, men in paddled up to our houseboat in their shukra's tempting us with pashmina, beautifully made paper mâché products, bouquets of colourful flowers, jewellery, precious stones, beautifully carved walnut and mahogany products and even cashmere socks. We even had a tailor visit to measure the girls for the making of their traditional Indian outfits. 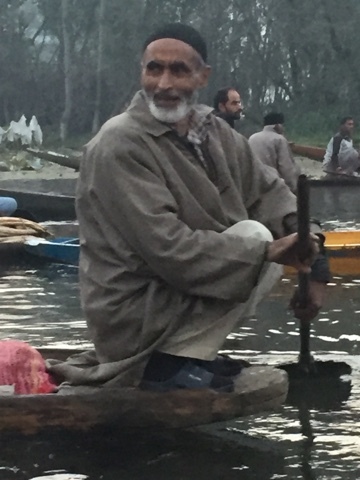 Our journey out on Dal and Nagine Lake was lots of fun especially visiting the local vegetable markets watching the locals barter with each other trying to get the best price for their products. The lake is like glass which makes for great photography especially as the mist settles on the water lilies. We not only went out on the Shukara's, but we're taken to a viewpoint unfortunately it was hazy, the gardens are still stunningly colourful even though it is autumn. We visited a pond where Ghandi's father drank the water from a spring. 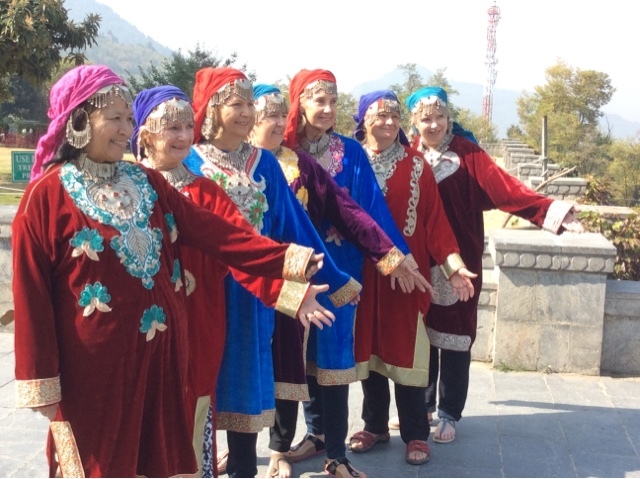 We had a bit of fun and frivolity when we dressed up in traditional outfits and posed for photos. 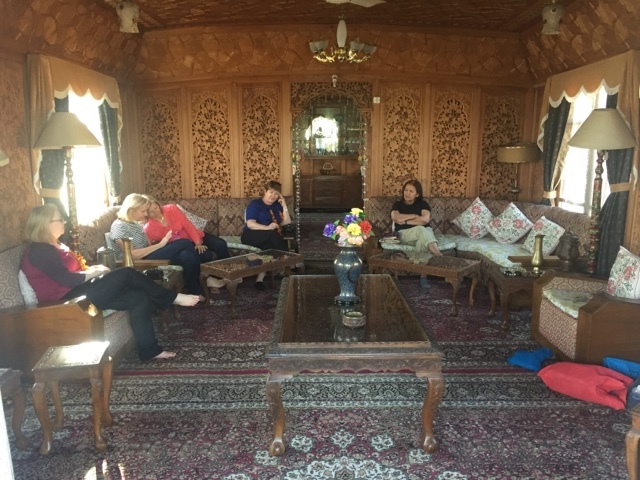 After Tanu took us to a local carpet manufacturer where we were first given a special green tea, before they rolled out the carpets, every one in a different design, silk and wool. The girls negotiated prices and decided on selecting some outstanding carpets. We visited Tanu's Christian church where there are only 260 worshippers in whole of Srinagar, the largest of course are Muslims and Hindus. Sadly the Church was badly damaged by flood in 2014, and also previously burned down by activists. On the Sunday we visited the congregation were having an auction of local homemade products to raise money to restore the damaged church. We were kindly invited to join in on a delicious lunch in the beautifully manicured church grounds. Our bellies full we returned to our houseboat then decided we all need a walk so headed off to the local Internet to check our messages. 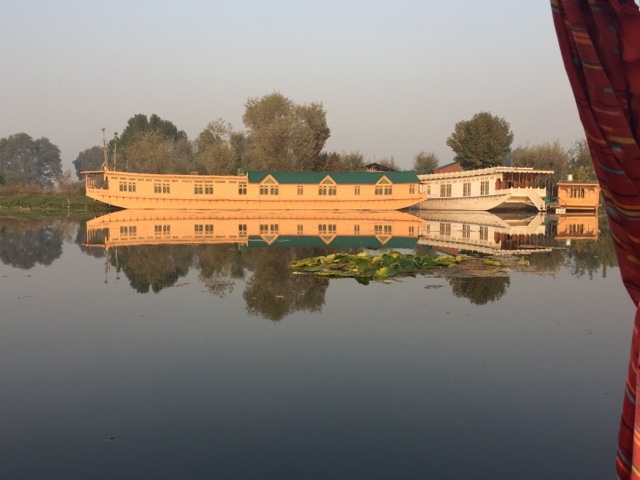 Our meals on the boat are carefully prepared by Hussain and his wife, a wonderful selection of Kashmiri food, pakoras stuffed with either cheese, vegetables, lotus root, curries, rice with fruits and nuts.